His Royal Highness Prime Minister Prince Khalifa bin Salman Al Khalifa chaired the regular weekly Cabinet session, at the Gudaibiya Palace today. HRH the Prime Minister lauded the positive outcomes of His Majesty King Hamad bin Isa Al Khalifa’s recent visit to Turkmenistan, and his talks with President Gurbanguly Berdimuhamedow there. HRH Premier stressed the importance of the results of the royal visit to Turkmenistan in enhancing bilateral relations through the agreements and memoranda of understanding (MoUs) signed during it, noting that they will serve the interests of the two countries and their brotherly peoples. In this regard, the session endorsed a draft-decree on setting up a committee to follow-up on the implementation of the agreements and MoUs signed between the two countries on the sidelines of the royal visit. HRH the Prime Minister praised the UNESCO King Hamad Bin Isa Al Khalifa Prize for the Use of Information and Communication Technologies (ICT) in Education. While commenting on a report submitted by the Minister of Education in this regard, HRH Premier highlighted the distinguished role played by the UNESCO King Hamad Bin Isa Al-Khalifa Prize for the Use of ICT in Education in encouraging initiatives that serve the UNESCO future goals, and extended congratulations to the laureates of this year’s edition. HRH Premier highlighted the importance of the oil and gas sector in boosting economic development, especially in the midst of unprecedented changes it is going through, lauding, in this context, the 21st Middle East Oil and Gas Show and Conference (MEOS 2019), held recently under his patronage and opened on his behalf by Deputy Premier, Shaikh Khalid bin Abdulla Al Khalifa. HRH Premier stressed that MEOS provides a platform for exchanging expertise and successful practices in order to outline the future of the energy sector and promote the latest innovations in this field. HRH the Prime Minister, marking the near advent of the 2019 Bahrain Grand Prix, welcomed the kingdom’s visitors and F1 fans, wishing everyone success in organising the global sporting event which, he said, enjoys the support of His Royal Highness Prince Salman bin Hamad Al Khalifa, the Crown Prince, Deputy Supreme Commander and First Deputy Prime Minister. The Prime Minister gave directives to all ministries and government departments to harness all potentials to ensure the success of the event and consolidate the kingdom’s prestigious reputation in hosting it. 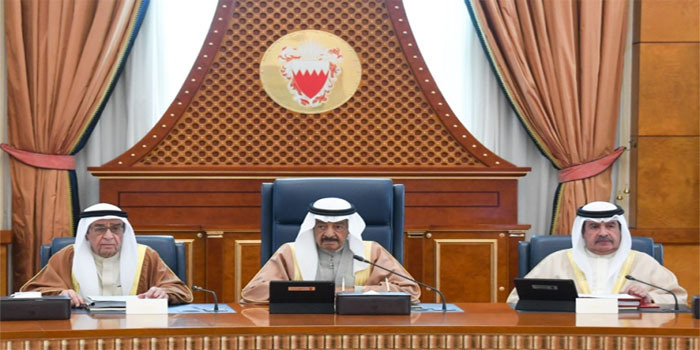 The cabinet was informed that all preparations had been completed to host the 2019 Bahrain Grand Prix, which will start here on Thursday. HRH Premier gave directives to conduct a comprehensive probe into the Hamad Town Intermediate Girls School incident, and ordered the formation of a high-level committee, under the chairmanship of Deputy Premier, HH Shaikh Mohammed bin Mubarak Al Khalifa, to be in charge of the investigation. Comprising the Interior Minister, the Education Minister, the Justice, Islamic Affairs and Endowments Minister, the Labour and Social Development Minister, the Parliament Affairs Minister and Health Minister as members, the panel shall investigate the irregularities that are inconsistent with the school norms, determine facts and hold violators accountable to ensure the non-recurrence of similar regretful incidents in any school. The committee shall submit its final report and findings to HRH the Prime Minister. HRH Premier gave instructions to put forward the necessary solutions to the issue of medical graduates from Chinese universities. In this regard, the Prime Minister tasked the Supreme Council for the Development of Education and Training to propose the suitable solutions that would meet the situation of those graduates, in accordance with the standards set by the National Committee for the Evaluation of Academic Qualifications. HRH the Prime Minister, following his recent field visit to Sanabis and Marooza, requested the Ministry of Housing to coordinate with the Ministry of Works, Municipalities Affairs and Urban Planning to study the implementation of a housing project that would speed up meeting the housing needs of the local citizens. The two ministries were also asked to study the service needs of the citizens of the same region, and to submit a report on them to the cabinet. HRH Premier gave directives to follow up on the situation of private sector companies which fail to pay the wages of their employees regularly or according to schedule. The Ministry of Labour and Social Development was requested to cooperate with the competent authorities to put forward a more effective mechanism that would ensure those companies’ honouring of their commitments towards their workers. HRH the Prime Minister launched a programme to employ 240 newly-graduate Bahraini doctors. Under the scheme, which will be implemented over two years, beginning from 2019, the new graduates will be trained and rehabilitated by the Arabian Gulf University to work in public or private hospitals or health centres, as well as to open their own clinics. The cabinet decided to amend the criteria and requirements of medical professions, whereby Bahraini holders of master’s degrees in family medicine could open their own family medicine clinics. The Supreme Council for Health, the Ministry of Health, the Ministry of Labour and Social Development and the Labour Fund (Tamkeen) were requested to embark on implementing the programme launched by HRH Premier. The session endorsed a memorandum of understanding (MoU) between Bahrain’s Ministry of Industry, Commerce and Tourism (MoICT) and the International Trade Centre (ITC). The MoU aims to create a cooperation framework between the two sides to provide technical assistance, support Bahraini commerce, develop local exports internationally, boost small and medium-sized enterprises (SMEs) and build a suitable work environment. The session approved the 2018 report on the works of the National Committee on the Prohibition of the Development, Production, Stockpiling and Use of Chemical Weapons and on their Destruction, as recommended by the Ministerial Committee on Legal and Legislative Affairs, and presented by the Deputy Premier and committee chairman. The cabinet approved a memorandum of understanding (MoU) between Bahrain’s Supreme Council for the Environment and the Saudi Wildlife Authority. The MoU aims to enhance cooperation between the two sides in the fields of biodiversity and wildlife protection.